Concrete countertop color samples. Buddy Rhodes Concrete Products in Macungie, PA. When it comes to color options, concrete offers nearly limitless possibilities—shades of white, gray, brown, red, blue, yellow, green, orange, black and more can be created. So, if you’re looking for something to add drama to your home or want a countertop that complements your restaurant’s theme then look no further. Color can be applied throughout the entire mix with integral pigments, or applied to the surface of cured concrete with stains or dyes. There are different brands of pigments, stains, and aggregate colors, so concrete countertops will always be unique. Integral pigments offer the widest range of colors and are suitable for indoor and outdoor use. Pigment is blended into the mix, imparting color throughout the entire countertop. Nearly any color can be achieved by blending pigments together, allowing skilled craftsmen to color match, although this is not an exact science. In most cases, custom colors or color matching will be more expensive than standard colors. Pigments are stable colors and offer consistent and dependable results as long as measurements are precise. Since they are mixed throughout the entire batch of concrete, a substantial amount of product is required. Acid stains are applied to the surface of cured concrete. Stains are available in a limited range of colors, but can be mixed and layered to expand the possibilities. Acid stains form their color through a chemical reaction with the concrete. Stains are best applied by professionals, because the results can be varied and unpredictable due to their reactive nature. Since stains are applied only to the surface of the countertop, repeated abrasion can wear down the color, but sealers can prolong the life of the color. Acid stains are UV stable and can be used on indoor or outdoor countertops. Dyes are available in a wider range of colors than stains and can be mixed and layered creating numerous possibilities. Dyes are applied to the surface of cured concrete and can also be used to enrich surfaces that are already stained or integrally pigmented. Water- or solvent-based formulas are available. A UV sealer should be applied to protect the color, as not all dyes are UV stable. As with stains, dyes can be tricky to apply. Both dyes and stains can be used in specific areas as accent colors or with stencils to create designs. Dyes and stains can be more cost effective than integral pigments, as a little product can go a long way. Whether your countertop is integrally pigmented, stained or dyed, make sure it is sealed well so food and beverages won’t alter the color. Another popular color for concrete countertops is white. White countertops provide a crisp, clean look that many homeowners appreciate. Pigments or other additives must be added to the concrete to produce bright whites. Titanium White CountertopsEvolution Architectural Concrete, Essex, Conn.
Pristine Concrete IslandGet Real Surfaces, New York, N.Y.
Black countertops are versatile and add a high-end, custom look. Styles from shiny smooth to textured matte are possible depending on the finishing techniques used. Charcoal-Colored CountertopsDC Custom Concrete, San Diego, Calif.
Honed Black CountertopsPetra Cast Stone, Rockford, Mich.
Black IslandStone Soup Concrete, Easthampton, Mass. Pair with white cabinets and backsplash for a timeless black and white style. Inlay a pattern for a subtle design element. Use a matte sealer for a rustic contemporary feel that mimics slate. When you think of concrete, gray is the color that most frequently comes to mind. However, you probably didn’t realize there were so many variations of gray. Gray countertops are popular in modern homes and restaurants because of their industrial appeal. Some people opt to leave their concrete countertops the natural cement gray, while others add integral color pigments to get just the right hue. Kitchen Exhibits Beauty of Gray ConcreteConcrete Wave Design, Anaheim, Calif. Twilight Gray Island BartopHard Topix, Jenison, Mich.
Light Gray Carbon BartopAbsolute ConcreteWorks LLC, Seattle, Wash. If you’re looking for a more traditional countertop, brown is a good color. Brown countertops can be colored integrally or topically stained for a rich, earthy tone. Many people opt for brown because it can be used to create a look similar to natural stone. Brown and other natural colors are also known for bringing warmth to a home’s décor. Crimson & Black Stained CountersReformed Concrete LLC, Quarryville, Pa.
Umber Stained Countertops Mimic StoneEndless Concrete Design, Zionsville, Pa. When it comes to color options, concrete offers nearly limitless possibilities. So, if you’re looking for something to add drama to your home or want a countertop that complements your restaurant’s theme, then look no further. You can even let your counter be the focal point of the room with a wild design or mix of vibrant hues. Orange Restaurant CounterConcrete Revolution, Denver, Colo.
Countertops Become Artist's CanvasSunWorks etc., Annville, Pa.
Red Clay CounterNobel Concrete, Jenison, Mich. 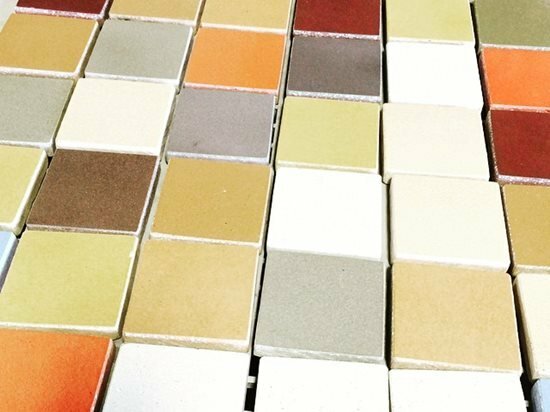 Most concrete countertop contractors will have standard samples on hand and offer custom color samples. If you are interested in seeing color samples, contact a local contractor for more information. Standard color samples (and remember each contractor's samples will be different) run in the $25-$50 range. Custom color samples runs $75-$150 and up. In most cases, the price of samples is applied against the cost of the order.